It is hard to imagine North America being more impressive than he was four weeks ago in the one-mile Group 2 $350,000 Al Maktoum Challenge Round 1, but he has apparently exited said effort in top shape and will get a chance to stretch out to what many believe is an even better distance for him in this Thursday's Group 2 $450,000 Al Maktoum Challenge Round 2 to 1 3/16 miles. A massive son of Dubawi, the Satish Seemar-trained gelding is an overwhelming favorite as he hopes to further materialize the Dubai World Cup dreams of his connections. “He got the six draw today and it's a small field of seven, so I don't think that's too bad,” Seemar said. “I maybe would have preferred a bit lower, but in this field, we are fine. There's one speed horse outside of him, but hopefully we jump (well) out of the gate. If he does that, I am not worried. Cosmo Charlie has been a project for his conditioner. Long well-regarded, the son of Travers (G1) winner Stay Thirsty has taken a while to come to hand because of his high-spirited nature. A sharp winner of the 2017 Al Bastakiya (Listed) over this trip, he had an overall subpar 4-year-old season, but ended it with sharp return to form when finally allowed to stretch his speed to 1 1/4 miles in The Entisar (Listed) last out on Dec. 20. Freshened since that 7¼-length romp, he has had his form franked when fellow Round 2 entrant New Trails manhandled a handicap field by 10 lengths last month. “North America broke so well last time in the Round 1 and we actually don't usually break too great, so that's a concern,” Watson said. “Charlie just has that kind of natural speed once he gets into gear. We might have to sit off him, if North America breaks like that again. We are going to break to go forward and leave it to (jockey) Pat (Dobbs) and his judgment. 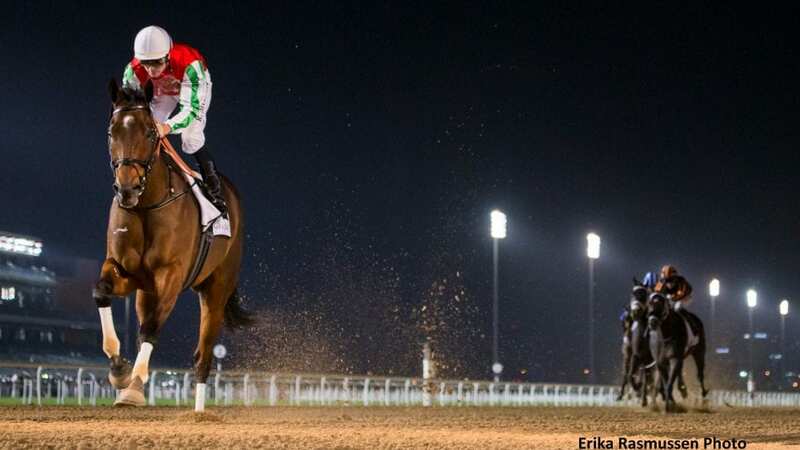 This entry was posted in Racing and tagged al maktoum challenge, cosmo charlie, doug watson, dubai world cup, Dubawi, North America, ramzan kadyrov, satish seemar, UAE by Dubai Racing Club. Bookmark the permalink.